Gabby, our nutritionist, visits our class every week for our Think Tank session, which supports our curriculum with food. 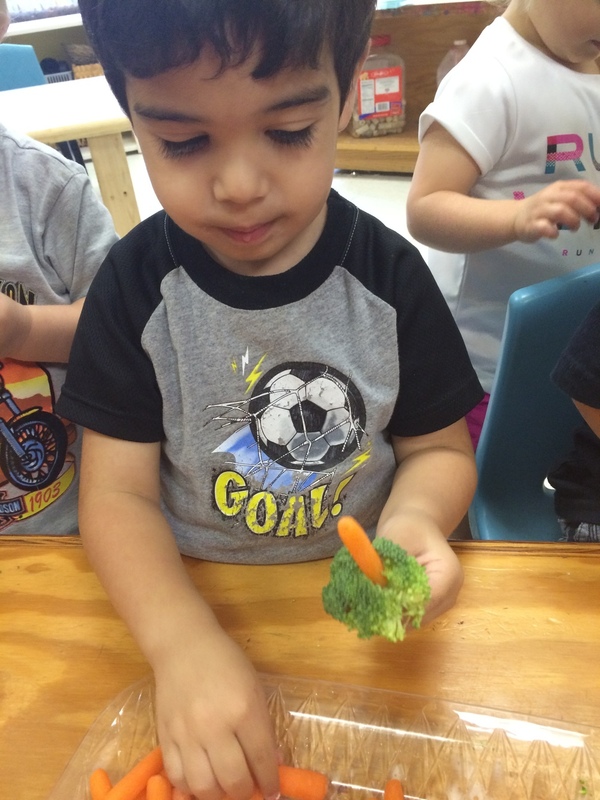 Healthy food like fruits and vegetables play an important role in our classroom because they teach us about the natural world, are interesting to learn about and come in all different shapes, sizes and colors. Not to mention they make a tasty snack. The children made observations using their senses to compare and contrast the two vegetables. This process encourages valuable researching skills such as attention to detail and careful observation. The children enjoyed feeling the different textures of each vegetable and discussing how different they look. One of our favorite things to do was discuss color and smell! Having a group discussion in which children can share their opinions and observations is important because it allows children to express their thoughts in an encouraging, supportive environment, gives them an opportunity to learn about their peers’ opinions and teaches them to respectfully agree or disagree. All of this is meaningful in building a child’s communication skills, personal relationships and self-confidence. Along with increasing communication, observational and social skills, this experience also doubled as a math lesson. The children counted the different vegetables. 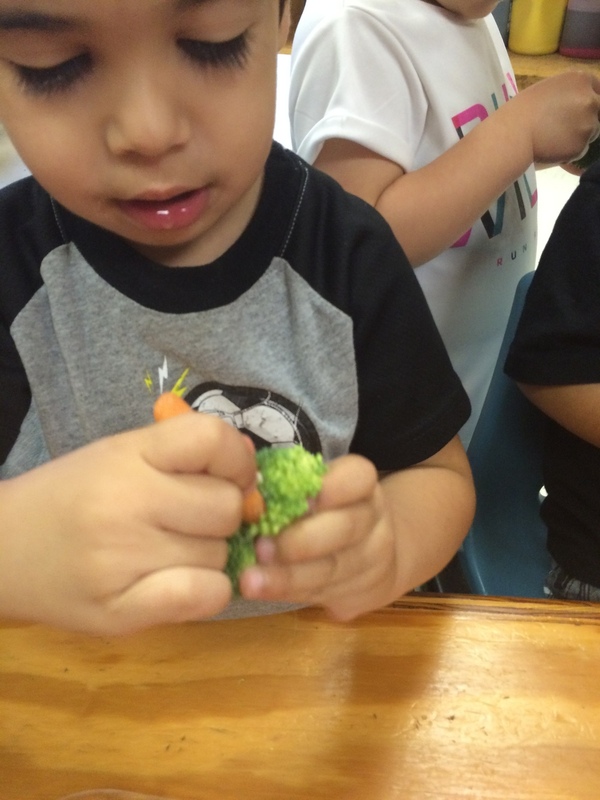 They noted the different shapes and sizes of the vegetables, enhancing shape identification and measurement skills. Also, playing with new or different foods and learning about them in fun, interesting ways increases a child’s chances of enjoying the food more. The more acquainted they are to the food, the more likely they are to feel comfortable snacking on it later. A food encounter like this one is important because it allows children to freely explore and become acquainted with a food at their own pace, in their own way. You will notice in several of the photos that some of the children spent time smelling the food by pushing it onto their noses. There were also some children who chose to see if they could combine the two veggies, pushing the carrot into the top of the broccoli. The encounter is based upon each child’s personal interests. We encourage this because we believe that a child’s personal interests drive some of their best personal learning experiences.